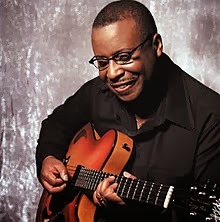 We have just had confirmation of the sad rumours which have been circulating since this morning, that British-born guitarist Ronny Jordan (born Ronald Laurence Albert Simpson) has died at the age of just 51. MOJO have published a tribute. Very sad. Ronny's 1998 release "The Antidode" became one of my most word out CDs that year and beyond. Used to sing his solos out loud in the car. Funky stuff. Really loved it. Will play him again tonight when I get home - it's been a while. The Antidote is my favorite CD. RIP Ronnie Jordan.